Nautical by Nature: Another anchor hoodie? 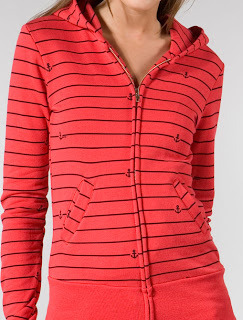 Last night I saw this Primp anchor hoodie (but in white) at Cusp. It was on sale but, in my opinion, not worth $94 (plus it fit kind of weirdly). Oh, we do love this one! But $94 for something with a funky fit isn't worth the $$$. Actually, anytime I've bought something that fit in a bizarre, wacky kind of way, be it on sale or full price, I have lived to regret it. I do not understand why I do it. But I understand the appeal - it is really cute. that's a shame, it's really cute! I am AMAZED at all of your nautical finds!